You can also join queries in the same way that you join tables and can also join both tables and queries. Joins behave similarly to query criteria in that they establish rules that the data must match before they are included in the query operations. Unlike criteria, joins also specify that each pair of rows that satisfy the join condition will be combined in the record set to form a single row. I explained table joins or relationship in chapter 2 (part 2). You may need to revise it because it is a prerequisite to Join Queries. This is part 4 of chapter 6 of the Free Online Access Tutorial Series at Microsoft Tutorial website. 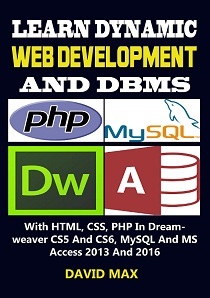 In this part, I will explicitly explain how to create a JOIN Query in Relational Database Management Systems (RDBMS) software like Microsoft Access 2016, 2013 and other lower versions. I will also explain object joins or relationship and then give you some practical exercises. 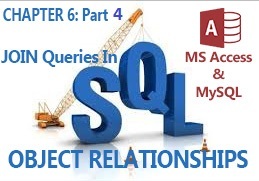 In the previous part (Part 3), I explained UNION query SQL in MS Access and MySQL in detail. Also see the full tutorial course content of this Microsoft Access Tutorial Series. Create an empty SELECT query through the Query Design option. Then switch the empty SELECT query over to SQL view where you can type your SQL statements directly. 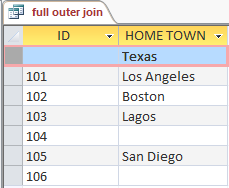 Inner Join shows only rows where a common value exists in both of the joined tables. They are the most common type join. When a query with an inner join is run, only those rows where a common value exists in both of the joined tables will be returned. For example, the tables below are used for storing information of emergency patients and those of regular patience in a Health Clinic. The first table is named emergency_patients and the second, regular-patients. The query returns four records that appear in both tables as shown below. Also note how I aliased the table names. Note also, the ON clause used here in place of the WHERE clause, you have Join Queries. When a query with a left outer join is run, it returns all the records from the first (left) table and the corresponding records from the second table that have a matching value in the join field of the first table. The query returns 6 records as shown below. 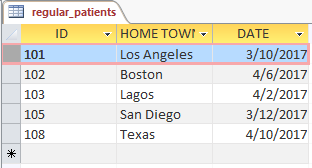 Two records returned in the screenshot above have empty data under the HOME TOWN field because the emergency_patients table don’t have the HOME TOWN field. So the query returned empty spaces. When a query with a right outer join is run, it returns all the records from the second (right) table and the corresponding records from the first table that have a matching value in the join field of the second table. The query returns 5 records as shown below. 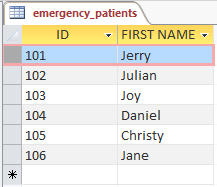 The last returned record has empty data under the ID field because the record was from the regular_patients table and has no matching ID in the emergency_patients table. So Access returned an empty value in that field for that particular record. 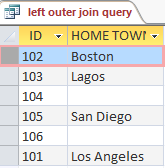 When a query with a full outer join is run, it shows all rows from both tables regardless of whether they are present in the second table. The SQL statement for a full outer join is database dependent. MS Access does not clearly support full outer join, but you can use a UNION query that combines the left and right outer join to perform it. The query returns 7 records as shown below. Do not use the ALL keyword when using a UNION query to perform a full outer join. Cross Join is also referred to as Cartesian Join. It mostly returns undesired results. It is a join of tables or queries without specifying the join fields or the join condition. 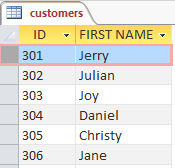 When this happens, MS Access combines every row from each table or query with the other rows of other tables or queries involved. A cross join is rarely the desired result, but an indication that some join conditions are missing in the SQL statement. Did you try running the above Cross Join SQL statement? What was your result? Of course an error message! Now let me test your knowledge in this chapter. Try to practise these SQL real life exercises on your own. Study the two tables shown below. 1. Design the two tables shown above inside one MS Access database. a. Only those that are both customers and debtors. b. All customers including debtors that are also customers. c. All debtors including customers that are also debtors. d. All customers and all debtors. This is the end of chapter 6 of this FREE online MS Access tutorial training series. In the next chapter (chapter 7), I will explain and illustrate how to create different types of reports in MS Access and then How to Design the Switch board.